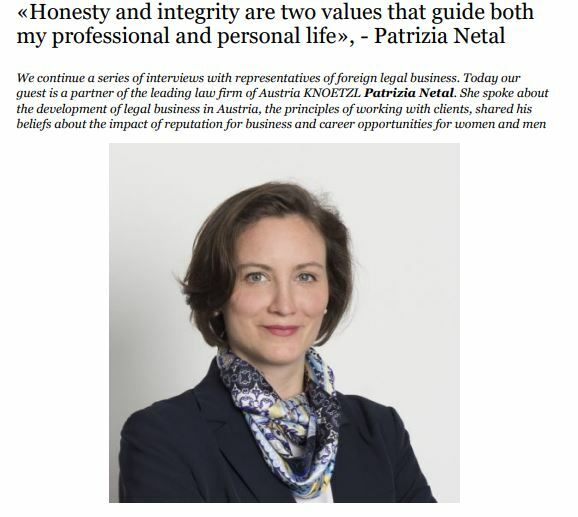 Integrity, honesty and understanding the client’s needs are at of utmost importance in the daily operations of Patrizia Netal’s arbitration work. In a recent interview with the Ukrainian legal publication Yurydychna Gazeta, the founding member of and partner at KNOETZL shares her views on the legal market in Austria and what made her choose arbitration for her own career path. She also addresses the importance of ethics in a profession that is based on trust as well as the under-representation of women in arbitration. Already as a law student, Patrizia Netal started to become involved in the organization of the Willem C. Vis International Commercial Arbitration Moot, the largest competition for students in the field of commercial arbitration and sales law. The challenging nature of international dispute resolution and the strategic opportunities involved in counselling raised her dedicated interest in this particular practice area. Patrizia witnessed a shift of focus towards M&A transactions and real estate investments in Austria since the country’s economy improved over the course of the last year. She also noticed that more and more companies are seeking out preventive legal advice on white-collar crime and compliance. In addition, Austria with its geographic position and Vienna providing for excellent logistics and professional legal infrastructure developed as an important arbitration hub often selected by SEE companies. Located in Kiew, Yurydychna Gazeta was particularly interested in hearing Patrizia’s views on the importance of ethics and reputation, as these topics are gaining more and more attention in the Ukraine. Whether acting as counsel or as arbitrator, trust is at the core of both roles particularly when operating on an international level. Read the full interview on Yurydychna Gazeta.